Side note on goals for spending, savings rate, and net worth: I am not discussing these goals here because they are so specific to each person/family. If you have not figured out what your goals are yet, it’s simple to just start with the 4% rule and refine your goals as you learn. This rule says that you need 25x your annual spending saved in order to consider yourself financially free. So once you track spending for a month, multiply it by 12 to get an annual number, then multiple that result by 25 to get your net worth target. You can lower that number by reducing your spending. I started writing this post about the things a person in their first year of pursuing FI might need to know or do and it keeps getting longer, so I split it up into multiple posts. The other parts are about getting spending under control, attacking debt, saving the difference, and what to do after the basics are covered. We recently passed the one year mark since we “found” the world of Financial Independence. While that first year of experience is still fresh in our minds and most of the fog of confusion has lifted, I thought now might be a good time to document some of the steps that we took and ones that newbies might take shortly after discovering FI. I know that sometimes people find out about FI and they love the idea, but have no idea on how to actually get started. All of the changes and decisions can be overwhelming, so I hope that our experiences plus some other ideas we’ve picked up along the way can help someone who is starting out. We never thought about our net worth until about a year ago. I always thought of net worth as something that only rich people were concerned with. The rest of us “normal” people were just hoping to save enough to retire comfortably, or at all! After starting to pursue FI, we finally sat down and figured it out. Our combined net worth was over $500k. I could not believe it – I’ve always felt like I was just a layoff away from poverty. The Lesson: Tracking net worth is not just for rich people and tracking spending is not just for poor people. Everyone stands to gain from getting more clarity around their situation. If you’re going to start pursuing Financial Independence, find out what you’re spending, what you’re saving, what you owe, and your net worth. You need to know all of these things in order to know the best way to get started. Determining your net worth can be a very eye opening experience. In some cases, you might find out that it’s negative and you need to get your debt under control. In other cases, like ours, you may find out that things are better than you expected. 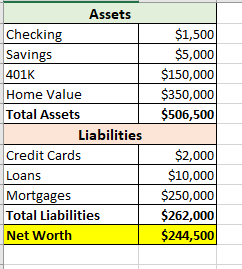 Simple net worth calculation example. Tracking your spending over time can help you understand where your money is going. When we started down this path, we were lucky that we were already tracking our spending at ClearCheckbook. This site is a digital checkbook register that allows you to enter your transactions and assign them to a category (you can also import them). It’s a little old school since it’s not going out and grabbing your transactions, but so are we. 🙂 Here is our affiliate link in case you’re interested: clearcheckbook.com. I have heard many recommendations for using Mint and YNAB. I have not really tried either of them and I have nothing against them, but I personally like the forced accountability of entering in every purchase. As a bonus, it has also helped us catch errors not in our favor. One time a bartender accidentally entered our tip amount as $40 instead of $4 and we caught it because of ClearCheckbook. You can probably accomplish the same thing by carefully checking all of your receipts against what you see online. No matter how you choose to do it, you need to know how much you’re spending on everything, so start keeping track! Savings rate is a key indicator in how long it will take you to reach financial independence. See this post from Mr. Money Mustache for a great explanation of why savings rate is so important. 50% is a commonly recommended target that I hear thrown around all the time and it’s a great one to aim for, if you can (see side note below). We are averaging about 40% for the last year or so. Let’s take an example of Ariel who makes $5000, and spends $3000 in one month. We include debt reduction as money saved since it increases our net worth. Therefore a principle mortgage payment or a massive student loan payment would not be included in our spending, it would be included in our savings. Other Salary: Spending reimbursements we get from our employers. I count this as salary because it would not be coming in if we didn’t have W2 jobs – it’s another part of the benefits package. Side income: Any amount we receive via side businesses. In addition to the tools already listed, I also use a spreadsheet that I downloaded from the Mad Fientist web site to track net worth, spending, and savings rate. You will have to do a good bit of tweaking to get it working for your personal situation, but once done, you’ll be able to see how much you spend per day on a certain category and how many years it is adding to your FI Pursuit. That’s it! Consider your situation assessed. Next, we are on to the fun part of making changes to increase the savings rate. Part 2 of this, about reigning in spending, is now posted. I am planning future posts about attacking debt, saving the difference, and what to do after the basics are covered.